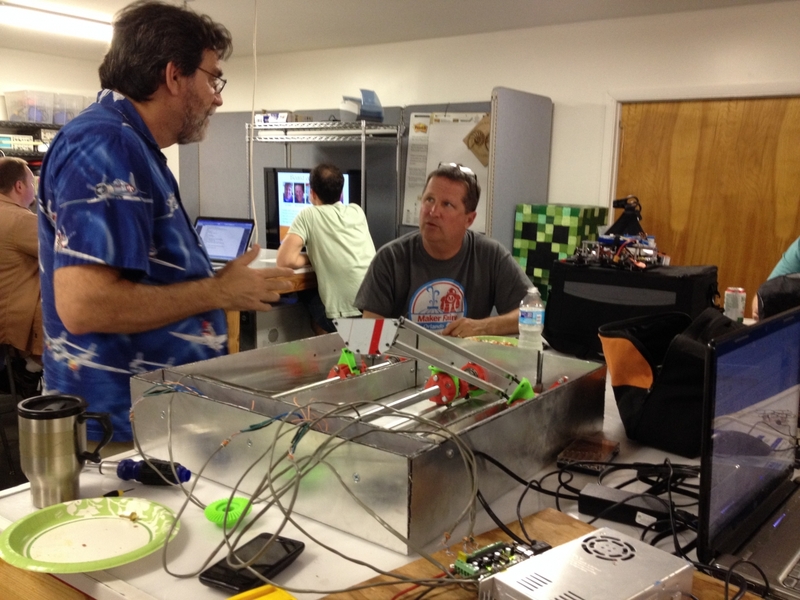 Tampa Hackerspace – Come Build With Us! Tampa Hackerspace is a non-profit, membership-driven workshop. If you like making stuff, we’re the place for you. We provide equipment, classes, and mentoring for many types of projects. Some of the projects our members work on: aquaponics, robotics, Arduino, Raspberry Pi, Internet of Things (IoT), electronics, ham / amateur radio, wearable electronics, home automation, microcontrollers, quadcopters, satellites, metal machining, Bitcoin and other alternate exchanges, computer security, photography, sewing, remote controlled aircraft, LED lighting, cosplay, steampunk, video and arcade gaming, 3D printing, art, etc. On most Tuesday evenings, we hold an Open Make Night where guests can come meet members, tour the space, get advice, etc. If Tuesday doesn’t work for you, contact us to make other arrangements or ask any questions. After joining and completing an orientation class, members* have 24×7 access to the space. Much of the fabrication equipment requires a training class before unsupervised use, but we generally offer those classes every month or by appointment if necessary. We are primarily a place for people to learn, share, and build personal projects or prototypes for their businesses. We do not provide manufacturing services (“I need someone to make X for me”) but several of our members do and we’re happy to refer you. We do not support mass-production (“I need to laser-cut 500 ornaments to sell”) but can help find appropriate businesses that do. * Members that join on a month-to-month plan (not prepaid and not a recurring billing plan) do not receive cardkey access to the space and will need to make arrangements with other members to get access to the space.